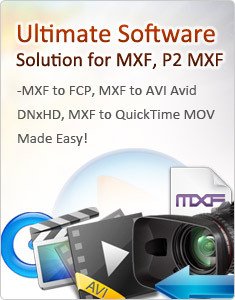 TransMXF, the best MXF converter, turns MXF videos into editable files for Avid, Premiere, Sony Vegas, etc. Convert MXF files to other formats with 5.1 channels being kept. You can convert MXF files to many other formats and even though the process has a conversion and transcoding, TransMXF can also ensure the audio quality and you can choose to keep the 5.1 channels with ease. Support multiple videos for output and convert files in batch. Give immediate visual snapshot with simple button. The program enables you to take snapshots of video with the width and height of the original video or particular resolution. You can get immediate visual snapshot soon after clicking to capture the video frame. It is easy to get thumbnail image or wallpaper for your computer. Convert at a fast speed and keep original video quality. With the advanced technology on the program, you can convert videos and audios at super fast speed and save a lot of time for your personal entertainment. The program also provides options to keep video quality to enrich your visual experience. Offer video editing with trimming, cropping, watermark, filter effects. It is not a big deal if you have taken in some unwanted part or black edges on the MXF videos. You can easily remove them with the trim and crop function. And you can also merge/combine/join several MXF files into a single one. Merge several video clips into one file for smooth playback. With the merge function available on the main interface, you can merge the selected files for conversion, and enjoy videos without interruption. Export video and audio with perfect synchronization. Aunsoft TransMXF adopts optimized audio and video sync technology, so as to output video with high quality and never let you get into trouble with the audio and video sync issues.